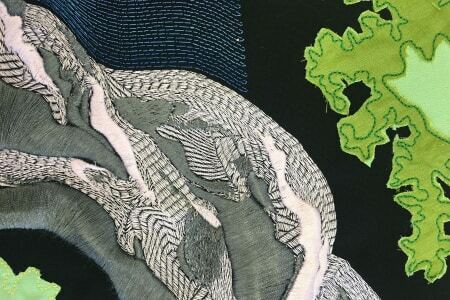 CREATING BEAUTIFUL, BESPOKE EMBROIDERY FOR LONDON’S ARTISTS AND DESIGNERS. 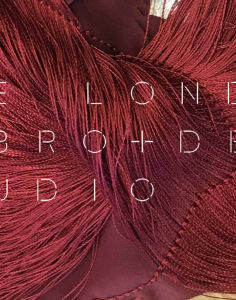 The London Embroidery Studio was set-up by RCA graduate Andrew Kenny. 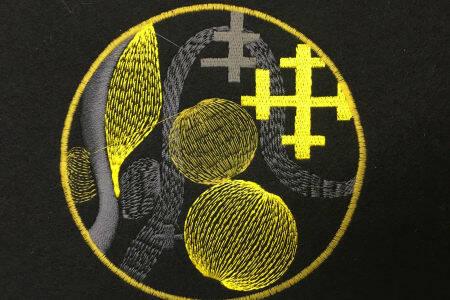 The Studio has been creating bespoke embroidery from their East London base since 2007. 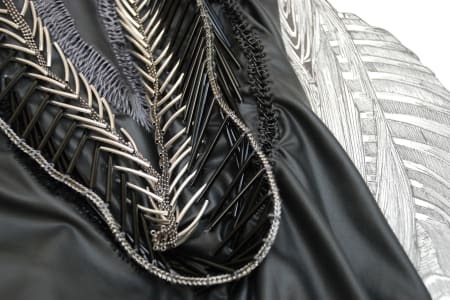 Their highly experienced team of technicians mix traditional methods of hand and machine embroidery with state-of-the-art computer technology. This enables them to create London’s most beautiful and innovative designs. 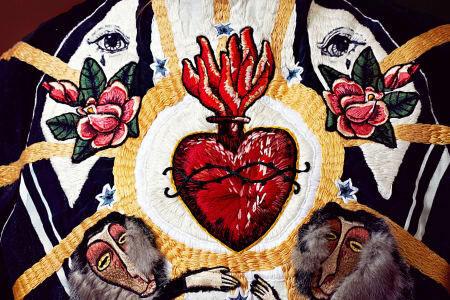 Their embroidery know-how is used by leading international fashion and textile designers and fine artists. Regular clients include Louis Vuitton, JW Anderson, ACNE Studios & Victoria Beckham. 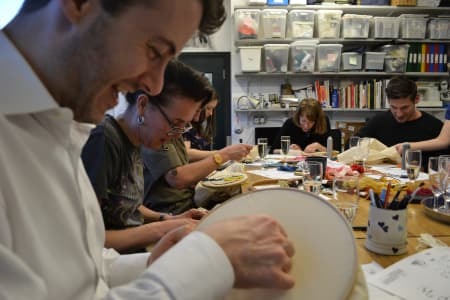 Develop professional skills in a creative environment with The London Embroidery Studio’s evening and weekend embroidery classes. 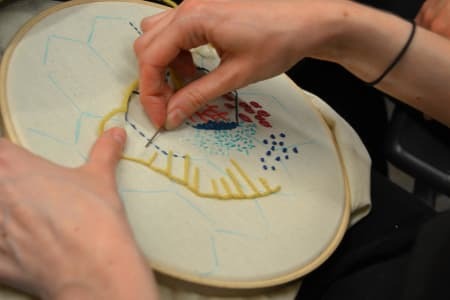 With their range of design-led courses, you’ll learn and develop embroidery techniques and how to apply them creatively in a design context. 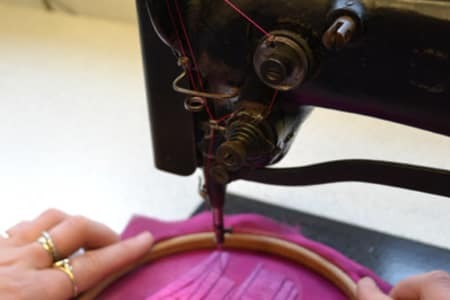 Most of their embroidery classes are focused on making a product so along with new skills you’ll take away a unique and usable item. 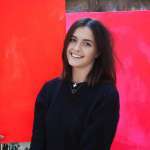 Held at their working studio, all classes are led by experienced tutors with industry backgrounds. Whether you want to expand your technical repertoire or just have a go and learn something new, the Studio offers classes to suit a range of experiences. Explore the individual course descriptions for more information. 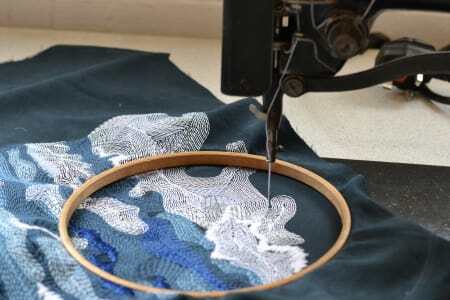 The London Embroidery Studio offers evening and weekend classes in hand, freehand machine and digital machine embroidery. This class was a really great introduction into understanding hand embroidery. The studio is a bright airy, contemporary space in Hackney. Olivia is a warm, patient and friendly tutor who greeted us with croissants, tea and biscuits, and taught us a number of different techniques and showed us how these could be manipulated to create different effects. We were given ample time to practice and play and were individually attended to for any help/queries. It is a very relaxed and welcoming environment. Brilliant. Ellie was a great tutor and she was happy to help me turn my ideas into a design. The class was small so there was loads of one on one time and the venue as lovely. I reccomended it to all my fashionable friends I think they'll love it! Thank you guys! Loved this course! Ellie was amazing, really clear and helpful. I have been in classes in other places where it was to full but this class was great lots of space to be creative. Highly recommend this class. The studio is a bright airy, contemporary space in Hackney. Olivia is a warm, patient and friendly tutor who greeted us with croissants, tea and biscuits, and taught us a number of different techniques. We were given ample time to practice and play with each technique and were individually attended to for any help/queries. At the end of the class Olivia gave us tips on where to make purchases. I thoroughly enjoyed the day. Thank you! The class was awesome. Alice is a great teacher. Gave me so much inspiration. It was great, very nice and cozy studio with lots of great pieces around from where you can get inspiration from. Welcomed in a very nice way, coffee/tea and biscuits. Definitely coming back and recommend if you are looking to experiment different beading and embroidery techniques. Lovely course - learnt loads and felt very relaxed at the end. The time flew. Can't really ask for more! Very enjoyable 2 hour sessions which covered the basic techniques and generated lots of ideas to take away and work with. Lovely new studio. Such a great class and I recommend it to anyone interested in CAD embroidery. The staff are knowledgeable and so friendly. The studio is well resourced as it’s a working studio so there so many pieces for inspiration. I found it so amazing to create something so beautiful in a short amount of time. And the biscuits were those great choco libentz ones. Thank you to Ellie and Josie for a wonderful day. I’m going to do as many courses here as my bank account allows. Excellent class that teaches you the basics of creating your own patches using computer-aided design. Beginning of the class teaches you the basics of the program, then you're let to try it out for yourself -- you can either design something there and then, or bring a photograph or graphic you want to digitize and embroider. The organisers provided tea, biscuits and croissants and there was an hour break for lunch. I really enjoyed playing with the program, picking out my 5 colours for my patch and then watching the machine sew it out. The embroiderers there directing the class were super interesting to talk to too. Attended with my husband. We both had a fab day. Very informative, we learnt loads !! Will certainly be looking at the other courses available. The class very very informative and the teacher was friendly. Amy taught us patiently and troubleshooted any difficulties we had. I managed to create 3 different little pieces and found this class very useful! The day whizzed by, I loved it! We were introduced to many new techniques and help was on hand whenever we needed it. I was introduced to new and different machines and I created some work I am pleased with. Thank you!